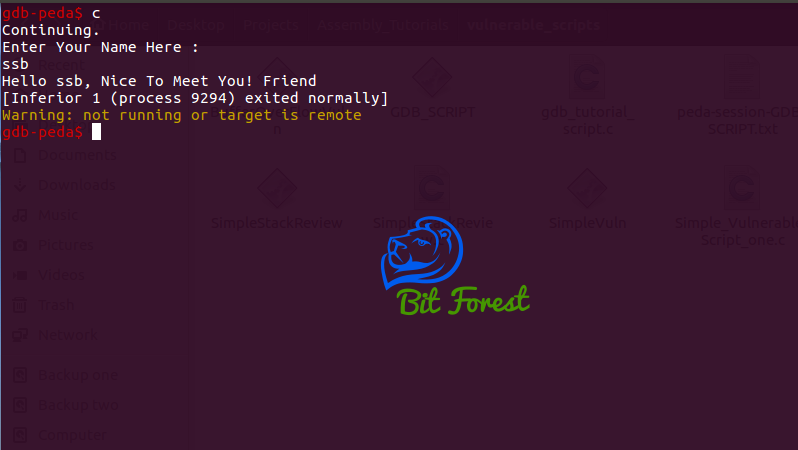 To Quickly install it in Linux Just Open Your Terminal And Type Below Commands. Now, let's quickly take a look how exactly gdb works. here, its a piece of code in C language. What we are going to do? 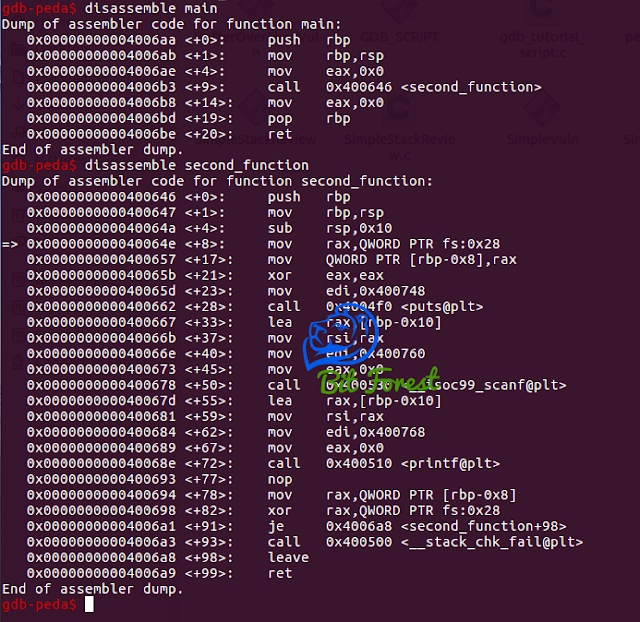 we will try to analyze this code in gdb. So, let's quickly move ahead with our sample code. Compile it with gdb argument. Please Note During Compilation, we have to pass -g argument in GCC compiler. This argument basically embeds source file information into the binary file that helps gdb debugger to understand binary file for clearly. Now, its Time to Run GDB. This command will simply open gdb interactive shell. As you can see in above image. gdb shell going to look like this if you also using Ubuntu and gdb-peda. Basically, This interactive shell works similarly like IPython Shell Or Normal Python Shell. To perform any operation with the provided file, we just need to enter function name with required argument and this interactive shell will do it automatically. 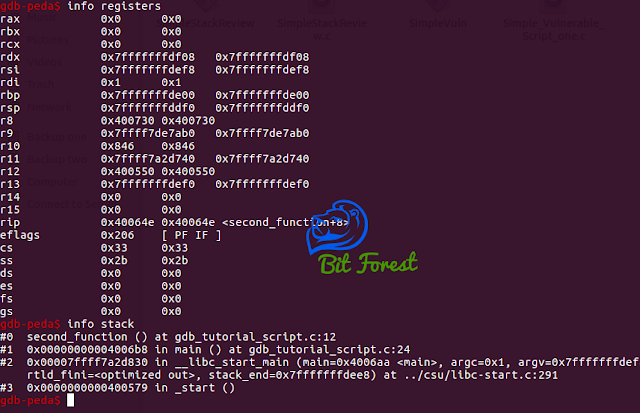 So, let's move ahead to basic command usages of gdb. This command basically Just provide the source codes in the output of compiled binary file only if you used -g argument during compilation in GCC compiler. 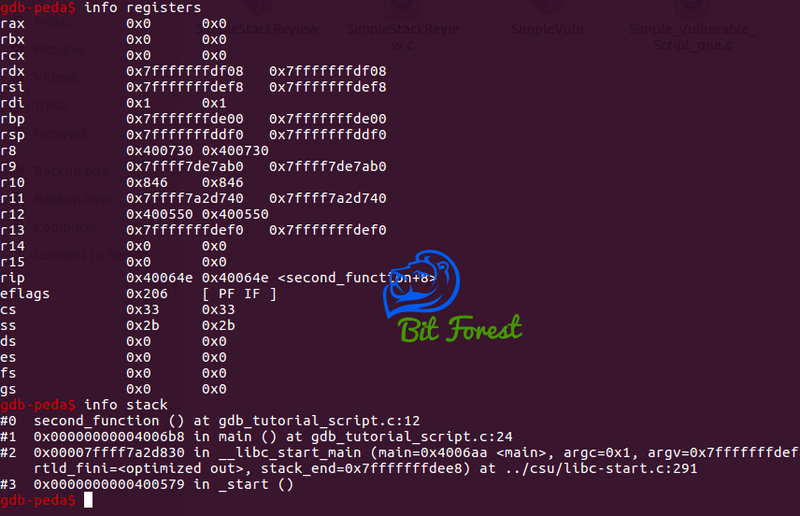 As its name suggesting, run command basically executes the binary file in control environment of gdb debugger. 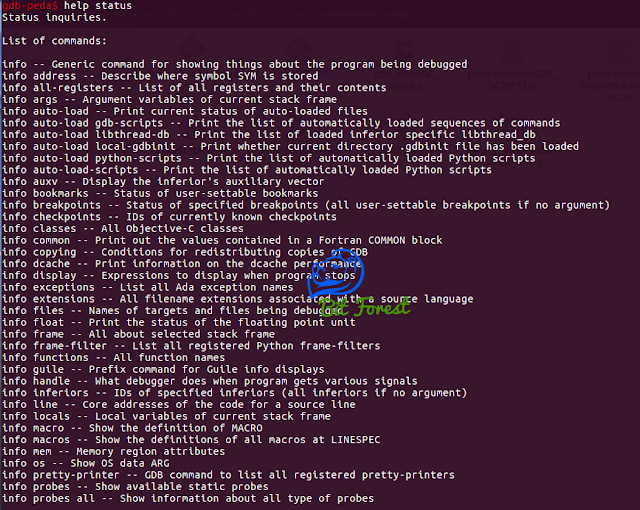 as you can see in below images, I just type run in the shell, and my program executes until it hit the breakpoint. At the break, point program stops its execution and wait for user input for future operations. I hope you all are noticing colorful output printed on the screen, basically, These output representing the current status of CPU components and memory like register table representing the status of various CPU registers, disassemble table representing function disassembly information and at the end, stack table representing information about stack memory layout. Basically, Step command means to run the program until it reaches a different source line. and Argument N means step N times (or till program stops for another reason). In Simple Words, With the help of step command, after performing the run function we can execute every single or multi-instruction of the binary program in a controlled way. For Example, after performing the run command, the program hit its breakpoint and stop its execution so I type s to perform only one next instruction. Information command provides us different types of informative data information required to understand the operation execution correctly. 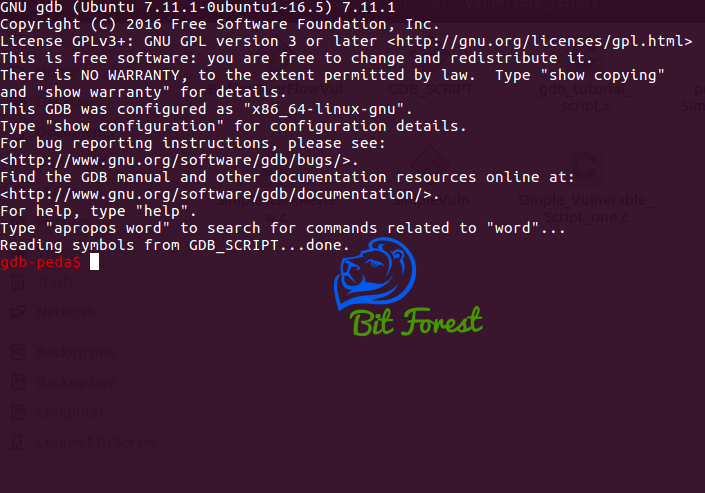 In the simple word with Information, command user can check and get different types of gdb program execution environment information. 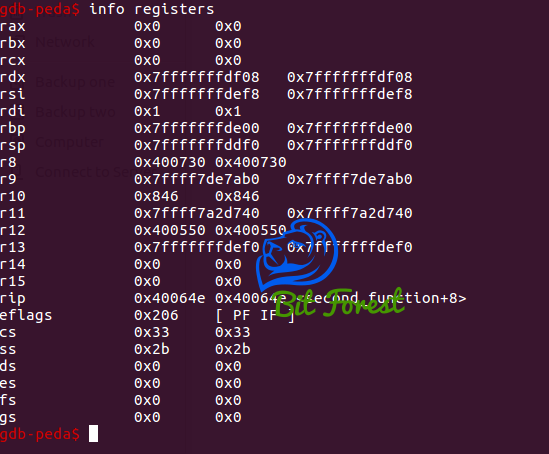 For Example, after performing various information of binary file but now, in the middle of execution, I want to see the status of registers. 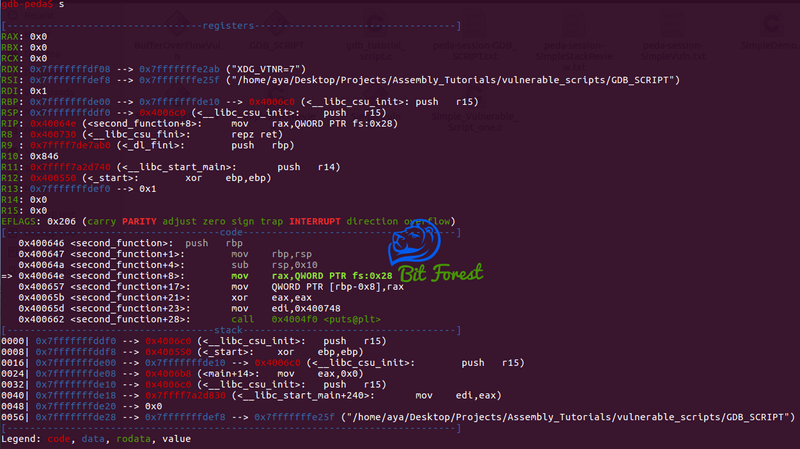 so, I have to do, is just type info register in gdb shell. let's take another example. Now, I want to see the memory status of stack memory. so, what I have to do, is to just type info stack command in gdb shell. As you can see in above image here, it is stack memory status. So, As you can see in above post, with disassemble command we can easily see assemble code of functions. Help Command provides us the List of the class of commands. 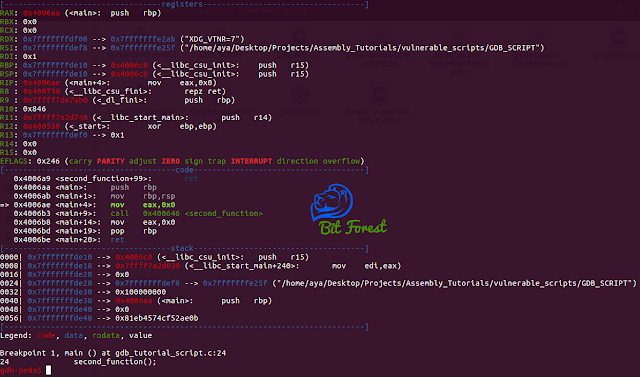 As you can see in above images, gdb shell prints a list of classes. now, another question arises how we can explore these help classes. well for this you just need to type help and the name of the class. 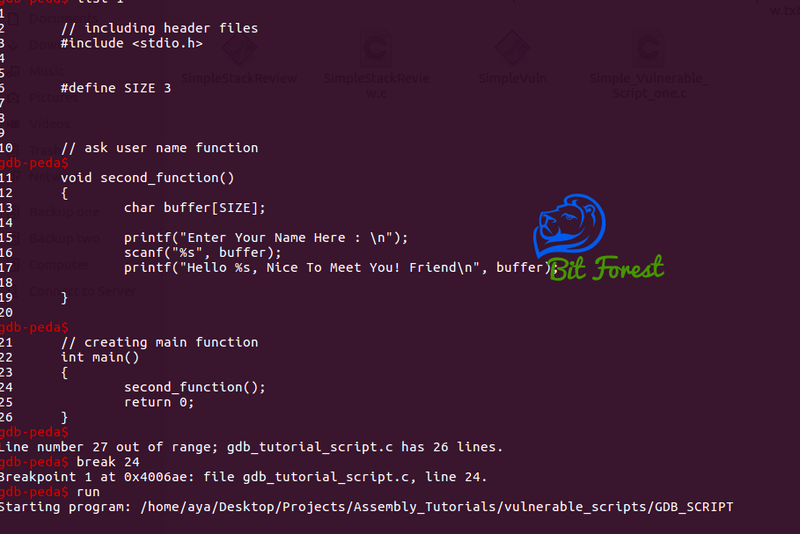 Well, With the help of help and info command you can easily find various function of gdb easily. 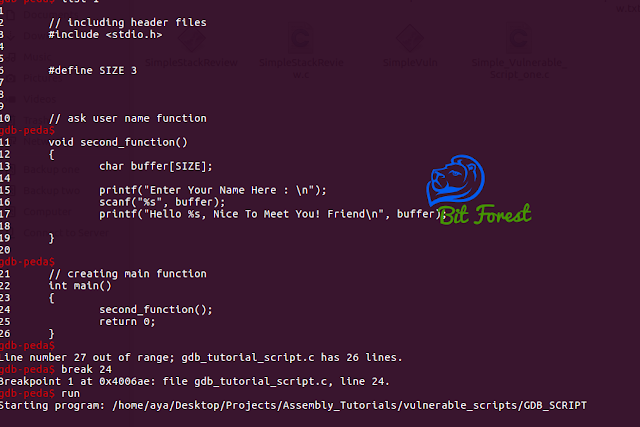 The Command also going to help in usages of various function. the breakpoint won't break until the Nth time it is reached). At The End, Quit command hehehe, I think it is not necessary to explain quit command because you all know it well. 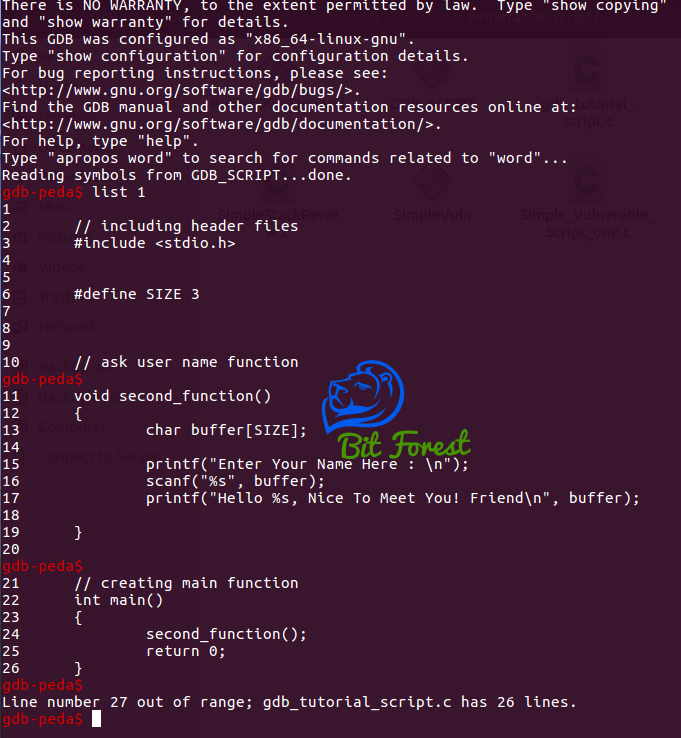 If you all like this tutorial and want more gdb tutorial.